Image from the British Library. Growing up in the South, certain things are drilled into your head. You assume, everyone learns these lessons. After a few critiques from people in other parts of the country, I realize that’s not true. What we in the South considers good manners, is not viewed the same in other areas. Shocking I know. Today, is a brief review of proper manners in the South. example: Yes, ma’am. I told daddy not to eat the deviled eggs, but he did it anyway. 2. Miss/Mrs. This is a fun one. Usually, the title is used with a last name. Here we like to use it with a first name, to make it less formal but still respectful. For instance, you would never call your Sunday School teacher by her first name. Yet, she’s known you since you were knee high to a grasshopper. Using her last name is too formal, you need something in the middle. Mr. can be used the same way, but it is more often used with women. 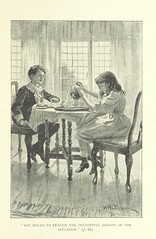 example: Mrs. Sadie, sit a spell and have a glass of ice tea. 3. Please/thank you. Do I need to explain this? 4. Never send a container back empty. If you borrow a container, or take a container of food home from a get together, you should return the container back with something inside. Preferably, something sweet. If you are incapable of cooking and Pohlmans is closed, under no circumstances do you send it back dirty. You will be forgiven for giving it back empty, if your cooking skills are nonexistent, but you will be talked about until the second coming if you give the dish back dirty. example: Mrs. Darla, thank you so much for that slice of pecan pie. It was delicious. I brought your Tupperware back and added a scoop of my mamas Banana Puddin’. 5. Never talk bad about the cook. I don’t care if the mashed potatoes taste like glue and the black eyed peas are hard as rocks, eat what’s on your plate, say thank you, and add how great it tasted. People here take cooking personal. If you insult the food, you will never be invited over again, and by the time it makes it around town, no one will have you over. example: My father married a woman from Texas. She’s part Mexican and never cooked Southern in her life. When they were first married she tried several times to make black-eyed peas. After he made the comment, “They don’t taste like my mama’s”, she never made them again. They’ve been married 45 years! That’s a long time to hold a grudge. 6. Offer to take a dish. If you are invited to dinner always ask if you can bring a side dish or a dessert. The hostess will probably tell you no, but you must ask. Sometimes, you should bring one anyway. If you know the hostess, you’ll know which is the correct course of action. If you can’t cook, pick something up at a respectable deli. These are just a few instances of proper manners in the South. There are dozens more, but you get the idea. What’s your favorite local/regional manners? Southerners have a beautiful way with words. Granted we drop consonants and sometimes entire syllables, but the flow of the language is beautiful, to me anyway. Not counting what Scott Bakula is currently doing to it on TV. I love you Scott, but honey you are NOT Southern. Like most regions of the country, our language is laced with unique phrases. Some of them have become clique, but a few are true treasures. Bless her (little) heart. This is classic. And like the women of the South, it’s hard to tell what the person really means. There usually two possible meanings. The first is an insult. The person using it doesn’t want to come out and say you’re an idiot. The second, is used in sympathy. Here is an example: “Did you hear about Sue Ellen? She tried to color her hair blonde, she fell asleep watching her stories while the dye was still on her head. Now she looks like a bottle of French’s mustard. . Bless her heart.” Unless, you know the speaker intimately, it’s hard to tell which meaning is intended. God willing and the Creek don’t rise. For historical reasons, I love this one. Creek is referring to the native Creek Indians of the Southeastern United States. There were a series of wars fought between the white settlers and the Creek Indians, and the phrase evolved from that. Settlers tried to make plans, but you wouldn’t know if the Creeks would attack. There’s no worries about the Creeks revolting now, but the phrase is still used. I have a feeling most think it has to do with flooding. Use it in a sentence. “Bob, you want go to a fish fry Friday night up at the camp?” ” Sounds good to me, God willing and the Creek don’t rise.” Trust me, unless there is a hurricane, if there’s a fish fry, the place will be jumpin’. There you go, a few of my favorites. I hear each of these at least once a week. Now, a treat. Watch the video below. It’s a hoot. Anyway. One critique questioned the sentence: “A hot breeze brushed by Beau, rustling the moss dripping from the trees.”. Be nice, it’s a WIP. The critique mentioned moss is wet. (Let me say first, this was a very helpful critique.) Well, actually…. I was shocked to realize not everyone knows about Spanish moss. I had assumed my readers knew what Spanish moss was, and I was wrong. Of course I had also assumed they knew about gill nets, local fishing laws, and the finer aspects of gator meat. But that’s another story and faux pas. I’m a lazy gardener and not a horticulturalist, so bear with me. Moss-is a mat of small (tiny) plants that form a carpet over damp, moist, and shady areas. It is soft and cushy. It’s usually a beautiful shade of bright green. I love this kind of moss and take many pictures of it when forced to hike. As seen below. Spanish Moss- is not a moss at all. It is a bromeliad (angiosperm). It’s an air plant. They grow in long brown strands that clump. It’s lightweight, airy, and dry. It’s beautiful to look at as it hangs from monster sized oak trees that line avenues to pre-civil war mansions. 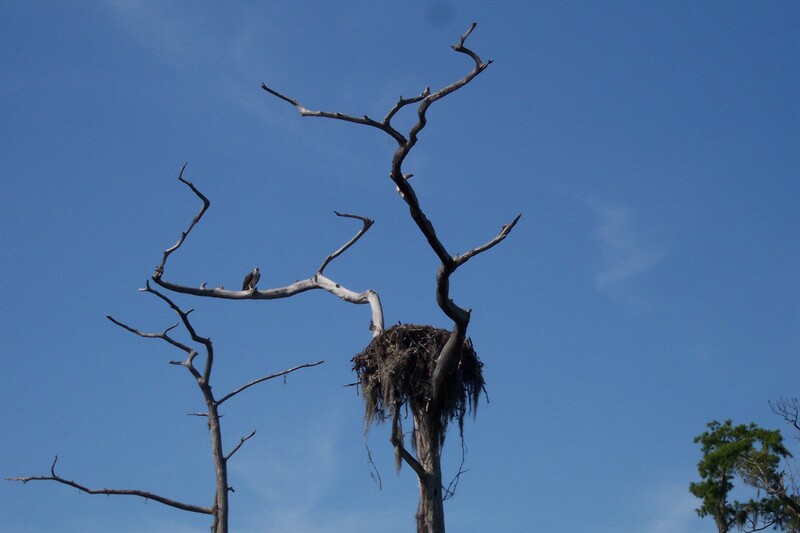 Or in my story, hang from cypress trees along gator infested bayous. See photo. 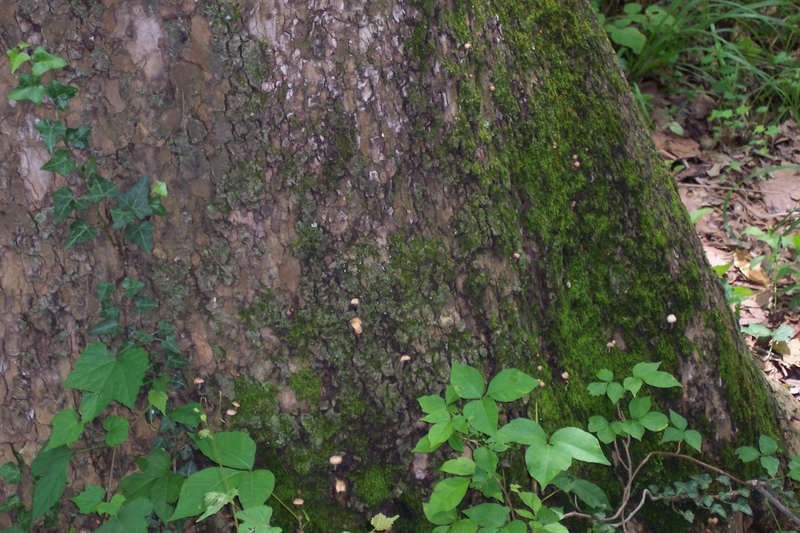 Mystic moss– There is a third type of moss found only in Mobile and New Orleans during late winter or early spring. It is caused by an unnatural phenomenon called Mardi Gras, where masked revelers rising atop paper mache floats slinging plastic beads into a hoard of drunken strangers. The stately oaks, minding their own business of lining the streets of downtown, get caught in the crossfire. 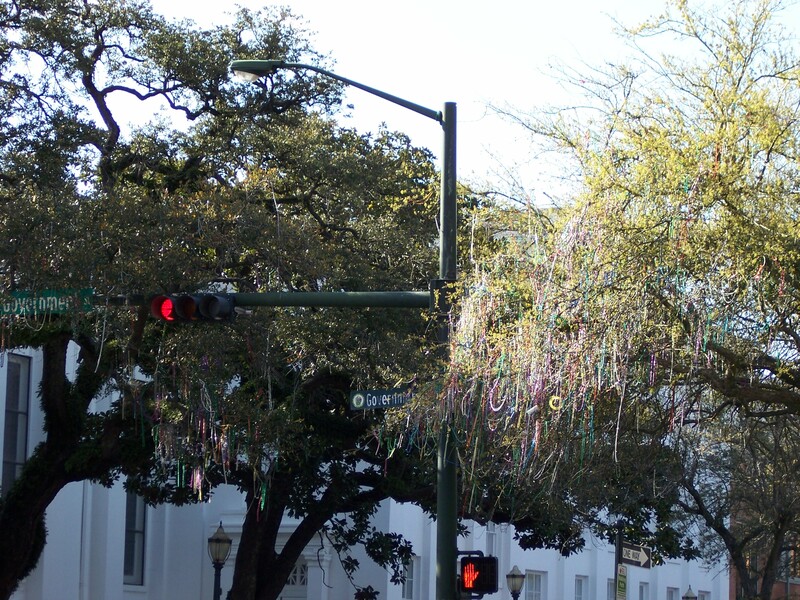 The oaks become entangled with beads. No word on how the trees feel about the situation. See photo. I hope I have helped those unfamiliar with types of moss. My husband agrees with the critique and told me moss does not rustle. There will be no corn bread for him at dinner tonight. I shall now check my MS for any Southernism that may need explaining.